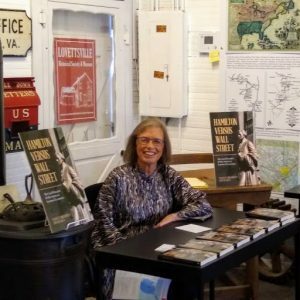 April 7, 2019—This afternoon I had my first book-signing event, which was held at the historical museum in my home town of Lovettsville, Virginia (population 1600). I am pleased to report that it was a success. Ten people came, and I sold and signed 11 copies of Hamilton Versus Wall Street, The Core Principles of the American System. Lovettsville Book Signing April 7. I gave a small talk in which I addressed three points: 1) how I became interested in Hamilton through the Report on Manufactures: 2) why I revived the project now, in the context of the popularity of the Hamilton musical; and 3) the unique perspective which my book brings to the discussion on Hamilton, specifically the content and history of the American System of Economics. A lively discussion followed. Hopefully this will be the first of many such events, building up to the major American Book Expo at the end of May/beginning of June in New York City. I am still in the process of raising money to fund my attendance, which will also include a book signing in the midst of a huge audience attending the Expo’s public session. (I’ve raised about 60% of the needed amount.) You can help me afford this event by contributing to my GoFundMe account. And if you haven’t read Hamilton Versus Wall Street, I recommend you get a copy from my publisher at https://www.iuniverse.com/bookstore. Just put in the name of the book, and the right page will pop right up.